Carl Yastrzemski will be the latest Red Sox legend to be immortalized outside of Fenway Park. The club announced Wednesday morning that the Hall of Fame outfielder will be honored with a statue outside Fenway Park. The statue, which will sit outside Gate B of the ballpark, is set to be unveiled Sept. 22 before a game against Toronto. 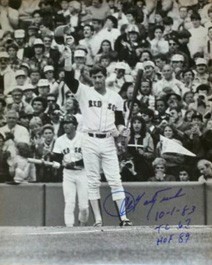 The bronze statue will capture the moment prior to Yaz’s final at-bat, when he tipped his helmet to the crowd at Fenway Park. Yastrzemski will also throw out the first pitch before the Red Sox-Blue Jays game that day. Yaz’s statue will be the third constructed outside Gate B at Fenway. Fellow Sox legend Ted Williams has a statue there as well as “The Teammates” statue, which depicts Dom DiMaggio, Johnny Pesky, Bobby Doerr and Williams.